Broan is one of the fine brands of consumer appliances that C&W Appliance Service repairs. They have a particular product line, attic ventilation fans, that we thought you should know more about as they can do wonders for your energy bill while preserving the life of your home from the top down. The terrible truth is that your roof and attic receive the full battering of the sun. While they protect you and keep you cool and dry, temperatures up there can reach 150°F! All this heat and any resultant moisture gets trapped in the attic, affecting the roof deck, rafters, and any belongings you may have stored there. Think of the long-term damage this can cause to your home! Adequate attic ventilation will allow any moist, stagnant air to be removed while drawing in fresh, dry air. Broan ventilation systems do just that so keep your AC unit from working itself to death. This creates energy savings for your household. 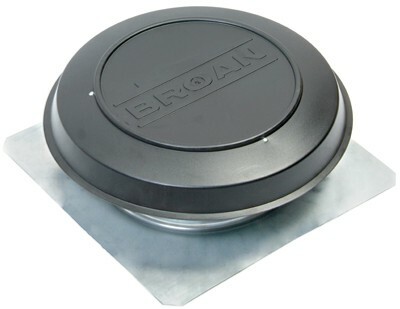 A Broan attic ventilation system will help to preserve the structural integrity of your roof by preventing moisture damage and even protecting the warranty on your roof shingles. Fresh air in the attic can ward off damage to insulation and wood from mold, mildew and rot. There are two types of attic fans that Broan sells: solar and electric. Broan solar fans operate on solar energy alone. The homeowner can install a solar fan without the help of an electrician by following the included instructions. The Broan solar fan is quiet and efficient, and may make you eligible for a Federal Tax Credit on price and installation! The Broan electric powered attic fan has its own advantages. They are higher powered than the solar models so remove attic heat quickly. Additionally, they provide consistent power throughout the day, even in cloudy weather. So, if you want to extend the life of your roof while cutting costs, consider one of the efficient attic ventilation systems from Broan. C & W Services offers friendly, efficient service for maintenance on Broan appliances.